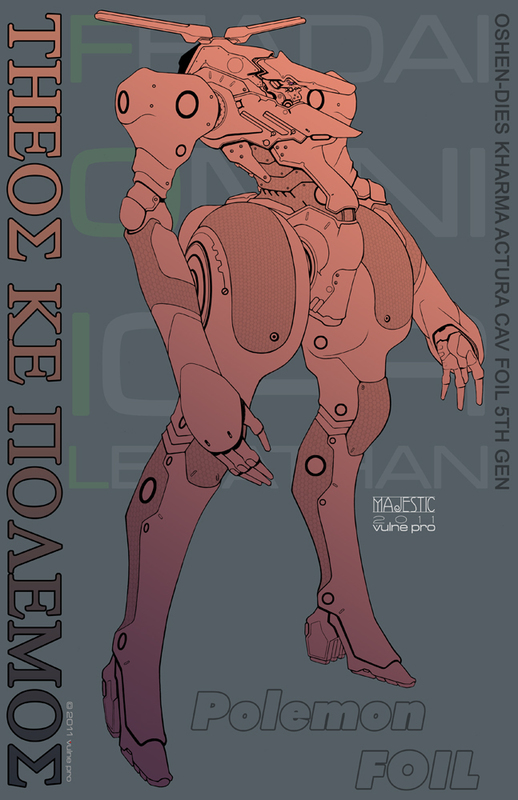 Here's another of the recent Theos combat FOILs in line art presentation, this time the Oshen-Dies Kharma Actura. As with the previous posts this design began as a thumbnail rough and went through the same basic process arrive at a final digitally inked design. The legs on this one owe a bit to Karl's (genocidalpenguin) design cues to a large degree though still my own stylistic approach. Also that little armor plate, right under the arm socket, that's sitting over the torso segments, was from Karl's Giza production model FOIL. They're sometimes little cues but important to imply a sense of cross pollination by the various fictional artisan's, a variety of parts manufacturers, and FOIL companies in the TKP universe. As we continue to explore possible FOIL designs it seemed a good idea to begin mixing some visual cue between all of us in order to express this more. This will likely continue to evolve with various TKP design work, FOILs or otherwise. 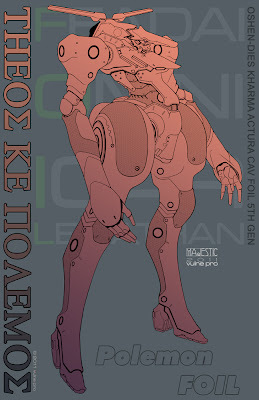 This machine is a late 5th generation evolution of the enigmatic bio mechanical combat frames that came to be known as FOILs, an acronym for Faedai Omni Icar Leviathan. The 5th generation FOILs evolved into a more utilitarian stripped down design philosophy. Less emphasis on artisan driven visual flamboyance with pure sculptural expression and more movement toward mass production with solid performance. This new approach to design was in response to a perceived pending change in the combat situation due to a looming new new threat. The threat assessment, by various tacticians and insiders deep in the political intrigue of SOL, was dire and the Faedai could no longer remain steeped in their code of honor driven controlled warfare by point spread. By the time the 5th generation of FOIL development had arrived it marked the end of a long tradition of battle tactics singularly unique to the planet Polemos. A new paradigm would emerge and things would never be the same again.